All original material copyright © 2015 by Craig Henderson, all rights reserved. The creator of it all saw his James Bond novels, published annually since 1953, gather a large following in Britain by the late 1950s, with a smaller but growing readership in America. And moviemakers such as Gregory Ratoff, Albert R. Broccoli, Kevin McClory and Harry Saltzman were eager to bring Bond to the screen. Get the complete four-season set of The Man From U.N.C.L.E. on DVD — all 105 episodes, the unaired and uncut pilot, the feature film “One Spy Too Many” and hours of exclusive interviews and bonus features — from Time Life Video. When North by Northwest hit theaters, the NBC television network already had moved in a similar direction by scheduling Five Fingers, TV’s first hour-long spy series and the first produced by a major movie studio, 20th Century-Fox. That gave Five Fingers the superficial gloss that previous, low-budget TV spies lacked, but not the imagination and style that a breakthrough spy show demanded. 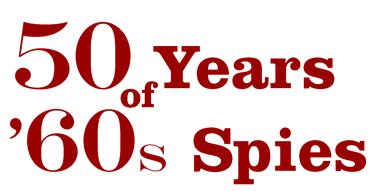 The series debuted in October 1959 and was off the air by January 1960. 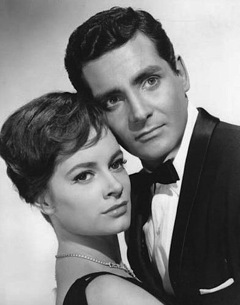 Series star David Hedison came to fame five years later in the sometime-spy series Voyage to the Bottom of the Sea, and then as the only actor to portray Felix Leiter in more than one James Bond film. Co-star Luciana Paluzzi was the real find, going on to serve as femme fatale to James Bond, Napoleon Solo and other movie and TV heroes. And the show’s last two episodes aired on Jan. 2 and Jan. 9, giving Five Fingers at least a tenuous claim to being the first 60s spy show. Released in July 1959, Alfred Hitchcock’s North by Northwest established the pattern everyone would first try to emulate: The debonair hero who keeps his sense of style and sense of humor while subjected to ever more outrageous thrills and spills as he battles an equally suave villain to protect vital secrets that could affect the fate of the country or the world. Hitchcock, the long acknowledged Master of Suspense, seemingly spent his career building up to this ultimate in romantic thrillers, and everyone who dreamed of bringing James Bond to the screen agreed that Hitch was the man to do it. Hitchcock, unfortunately, was not interested in repeating himself. The series that would become the longest running and most beloved of all 1960s spy shows made an inauspicious debut on Jan. 7, 1961, in most of the broadcast regions that made up Britain’s ITV commercial television network. London and other ITV outlets didn’t pick up the show until March. 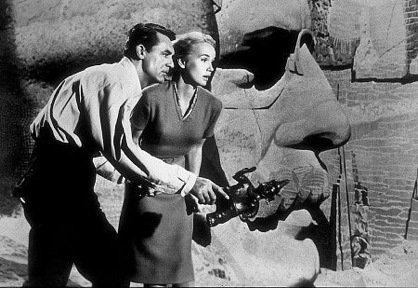 Though its creators claimed Fleming’s stories and Hitchcock’s films as inspiration, The Avengers spent its first year on the air just trying to find the right tone while doing its best to avoid thriller cliches. As a mystery-adventure program, The Avengers also was hindered by production standards that American viewers would find downright primitive: the show was confined to a TV studio and recorded on videotape. British viewers were used to such programs, but The Avengers would never sell in America and become a classic of the genre until it broke out of that crippling television-play format. “The Avengers” also had to learn to break with such conventions as trenchcoats and male leads. Of course that’s Patrick Macnee as John Steed at right, without a hint of his later Edwardian dandy wardrobe. 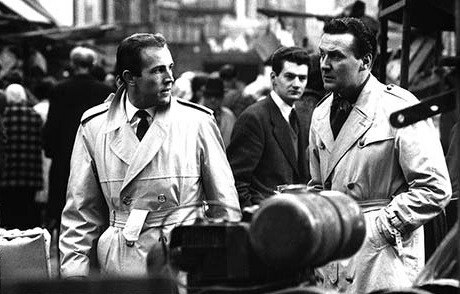 Ian Hendry, on the left, played Steed’s original partner, Dr. David Keel, a London physician whose fiancee was murdered by drug smugglers (that’s who The Avengers started out avenging). Hendry, in fact, was the top-billed star of the show. Only when he refused to return for a second series did the inspiration strike to give Steed a female partner. Another major event early in 1961 was the inauguration of John F. Kennedy as 35th President of the United States, and everyone wanted to know all about the glamorous, youthful new president. The March 17 issue of LIFE magazine covered one aspect of the Kennedy intellect in a story titled “The President’s Voracious Reading Habits,” written by longtime Time-Life White House correspondent Hugh Sidey. A discussion of Kennedy’s favorite titles and authors included the expected historical tomes, biographies of great men and analyses of world events, but Sidey also noted that the president was partial to Ian Fleming’s stories about his “undercover man” James Bond. And a list of 10 of Kennedy’s favorite books included Fleming’s fifth (and, many would say, his best) novel, From Russia, With Love. 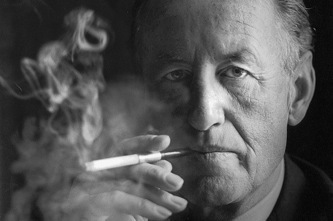 More than one observer believed Fleming’s inclusion was a rather obvious ploy to make Kennedy look a little less like a total egghead. But contrived or not, it was the plug of all plugs. 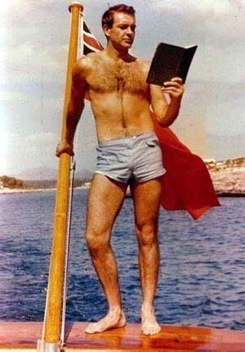 JFK reads Ian Fleming! From that point on, all of Fleming’s titles became bestsellers in the United States and James Bond was well on his way to becoming a household name long before the release of the first Bond film. 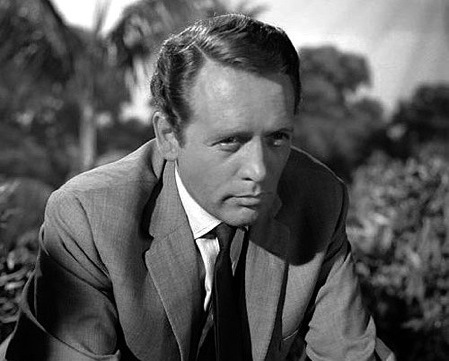 Patrick McGoohan had his first TV series role as John Drake in Danger Man, the spy adventure that premiered April 5, 1961, on CBS. In this first incarnation, Drake — later to return in Secret Agent and arguably as the central character in The Prisoner — was a transatlantic agent who worked for NATO and reported to offices in London and Washington. CBS bought the show to fill the timeslot vacated by Wanted Dead or Alive, the Steve McQueen western that had just been canceled after a three-season run. It was something of a symbolic handoff from one TV craze to the next. Danger Man was already a success in Britain, where it debuted on ITV in September 1960. The show was made by ITC, the British TV production company that had supplied CBS with the long-running Adventures of Robin Hood and the sci-fi adventure and sort-of spy show The Invisible Man. ITC pioneered filmed adventure shows for British television with an eye on sales to the American networks and other countries. Film not only made a slicker product, it could be easily telecast anywhere in the world, unlike the proprietary 405-line British video system that shows such as The Avengers were taped in. Danger Man may have been limited just a bit by its half-hour length, but the show was tightly written and neatly shot and edited. It doesn’t matter that CBS only bought it as a summer replacement and dropped it in September before all 39 episodes could air. It doesn’t matter that the show was overshadowed later by the hour-long Secret Agent and eventually was lost to obscurity. Its concept and execution, its dynamic and popular star, its British debut — four months before The Avengers went on the air and two years before James Bond appeared on movie screens — and its quick appearance on American television made Danger Man unquestionably the first 60s spy show, and John Drake the first of the many popular secret agents to follow. Gregory Ratoff announced plans to film Casino Royale in 1956 but the production never came together before his death in December 1960. Ian Fleming was certain James Bond would finally come to the screen when he made a film deal in 1959 with Kevin McClory — but the deal collapsed and now McClory was suing him over elements of the screenplay that appeared in Fleming’s latest novel, Thunderball. Cubby Broccoli had been interested in Bond for years but his erstwhile partner Irving Allen hated Fleming’s books. Harry Saltzman took a six-month option on the available Bond stories in December 1960, but he couldn’t find a studio interested in backing him and now his option was about to expire. One of the most fortuitous meetings in cinema history took place at the end of May when screenwriter Wolf Mankowitz introduced Saltzman to Broccoli. Rather than lose Saltzman’s option, now with less than a month to run, they formed a partnership and continued to seek backing through Broccoli’s contacts. 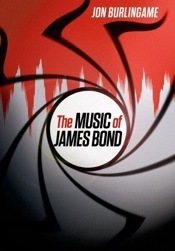 After Columbia Pictures turned them down, they met with United Artists on June 21 and signed the deal that finally brought James Bond to the silver screen. 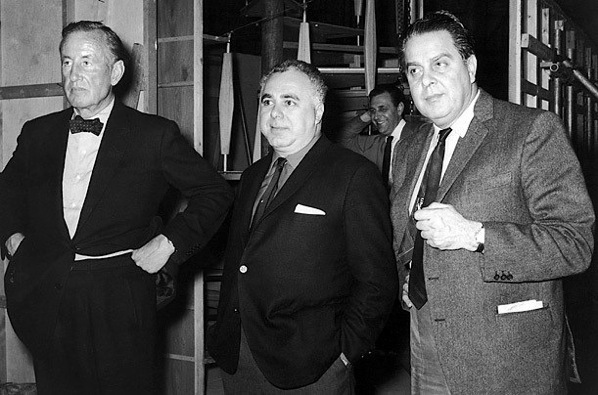 Left to right, Ian Fleming, Harry Saltzman and Albert R. “Cubby” Broccoli. “...offers a degree of music appreciation and insight that few possess” (Steven Jay Rubin, author of “The Complete James Bond Movie Encyclopedia”).